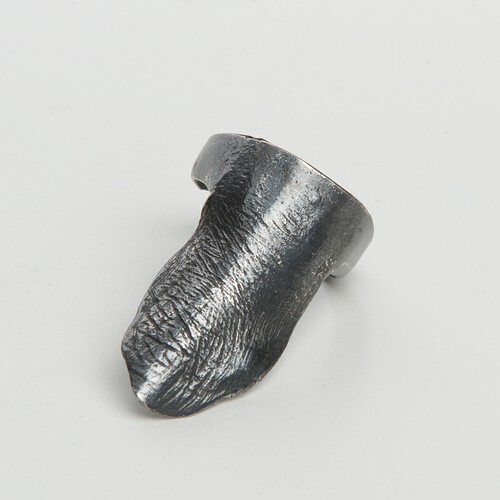 With a vogue fascination of anatomy, the Molded ring plays with the idea of jewellery as a second skin. Stockholm-based jewelry artist Cornelia Webb is inspired by the intricacy of the human body and the blurred boundaries of skin versus metal, the authentic versus the artificial. The Molded collection is deceptively realistic to real skin and molds perfectly when worn. As well as a symbolic celebratory tribute to the human physique, it also explores the realities of current and future inevitability of our society; our over-reliance on technological means and the ultra-realism of humanoid robots that respond and act like human beings, but one thing they lack is our vulnerability and the complexity of emotions. That is the true difference between metal and skin.